I’ve been thinking a lot about politics and fiction (especially speculative fiction) lately. For one thing, I often think about political issues. While I’m generally pretty mild-mannered and usually avoid political conversations, I do think about the issues. They matter to me. I’m no political activist or anything, but I try to educate myself on the issues, form my opinions, and try to act according to my conscience (with Wheaton’s Law being my guiding principle). For another, it seems that the world of speculative fiction is constantly in a state of “one thing after another” when it comes to politically-charged kerfuffles. With the issues with the SFWA Bulletin, and “fake geeks”, and the “feminization” of the genre, and the Hugo awards slate, and on, and on, and on–frankly, it gets exhausting. And, as a fan and a n00b writer, it’s disheartening. It’s a bit like standing in the hall as the parental units go for the jugular. You get to a point where you don’t care who’s right and who’s wrong, you just want it to stop. So when I first saw this article (“Politics Don’t Belong in Science Fiction”), I sympathized. Can’t folks just set their weapons aside and write “good” stories? Can’t we go back to that? But then…I thought a little harder. Started taking some things apart in my head on those long, lonely commutes to and from the day job. First of all, what are we talking about when we say we want to take politics out of science fiction? Obviously we’re not talking about candidates or elections or campaigns (though, really, some stories could be). We talking about the ideas that drive our politics. By politics, we’re talking about our working theories about how the world works–and how we want the world to be–that dictate how we influence the world around us. So what are we saying? That we want to take these ideas out of science fiction. That they have no place in it. I don’t think that we can do that. Even if we wanted to–and I’m not sure we do–I don’t think we could ever pull that off. Speculative fiction (all fiction, really) has always been about ideas. Some authors have been more overt about their politics, but such “big ideas” exist within and inform the narrative of even the pulpiest space opera or sword and sorcery epic. In the article I cited, the author brings up Heinlein, Asimov, and Clarke. I don’t think that anyone who has read these authors can say that their fiction is apolitical. Writing is a series of choices. You choose your characters, their histories, their motivations. You choose the setting, its movers and shakers, the status quo and the challenges to it. You also choose what characters aren’t used, what doesn’t motivate them, what is not challenged. The authorial choices you make are informed by your ideas of how the world works–or should work. You either subvert those ideas or you support them, but your choices are informed by them nonetheless. That’s not a conservative or a liberal thing–it’s a human thing. You can’t get away from it. And I’m not sure, as writers, we want to get away from it. These ideas are powerful engines in our fiction. They put our stories into warp drive, turn them into something special and world-changing. I don’t want “message” stories. I don’t need didacticism. What I want are well-crafted stories that make me think. That challenge me. That stay with me after I put my book away or shut down my laptop. They don’t have to bolster my politics but they can’t insult my intelligence. I want to see new and exciting things in my speculative fiction. I want to see what the universe can be if we work hard enough–or what it can become if we don’t. There’s room for all it on my shelf. From around the world and across the spectra–bring it! But I can also see where “taking the politics out of it” can become “taking your politics out of it”. Stories that I’m comfortable with are “not political” and stories that make me uncomfortable are “political”. But if all stories are, in some fashion, political, that doesn’t really work. The argument essentially becomes a way to tell people to shut up, to squelch expression, and that really doesn’t hold much water with me. It would be really easy for me to fall into that mind set. After all, “traditional” and “old fashioned” speculative fiction was written for me as the target audience. I can take such “political” ideas like racism and sexism and hold them at a distance, treating the arguments like intellectual exercises, because, in this time and place, they don’t directly affect my life. If I never think about race or gender or sexual orientation or politics again, my day-to-day would, sadly, be little changed. The status quo is comfortable, the political is troublesome. But for others, these so-called “political” folks, they don’t have that luxury. What I can call political and set aside, they call fighting for lives. The staus quo is troublesome and the “political” is trying to reconcile that. Of course, it’s just as much a political stand to maintain the status quo. To stand up for tradition or “classic” ideas. It’s a choice informed by belief in how the world works. And that’s the rub–there’s simply no getting away from politics. Not in fiction–not in life. 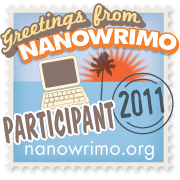 This entry was posted in Ramblings and tagged fandom, fantasy, fiction, politics, sci-fi, speculative fiction, writing. Bookmark the permalink.